Ginger-garlic paste : 2 tbsp. Garam Masala Porder : 1 tsp. Marinate the mutton with lemon juice, salt, turmeric powder, red chilli powder. Keep aside for 1 hour. 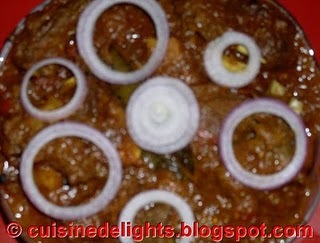 Take a pressure cooker add marinated mutton and 3 cups hot water and wait for 6 whistle. Open the pressure cooker and keep aside. Heat oil in a pan add bay leaves, peppercorn, cinnamon, green cardamom and cloves when seeds get aroma.Then add onions saute till it becomes soft and translucent . Add tomatoes and fry them all together for about 5 minutes . Then add ginger-gralic paste and fry them. Now add turmeric powder, kashmiri red chilli powder, coriander powder, salt and sugar and saute it. Add now boiled mutton and mix it with masala. When oil saperates the masala add one cup mutton stock and let it cook covered with lid. Mutton is half done, then add ghee and garam masala powder. Let it cook for another 5 mins. Serve hot with Mitha pulao and any rice dish and paratha also.